* This is a sponsored post, for which I was compensated. This post may contain affiliate links. How do you feel about fitness? What about spirituality? Morality? Intellectual curiosity? These are all powerful human traits that most of us possess. It's what makes us who we are. It's what makes us strong, innovative, and great. On January 28, 2015, Reebok launched their new brand campaign. This campaign is powerful, motivational, and inspirational, all wrapped into one enlightening package. The campaign kicked off with a Super Bowl TV commercial, called "Freak Show." If you haven't seen it yet, check it out below. This campaign has a very powerful message. It tells us to recognize our true potential in the mental, physical, and social aspects of our lives. With Reebok, we can perform in the toughest environments and activities. We can be more human, above all else. So, just how human are you? 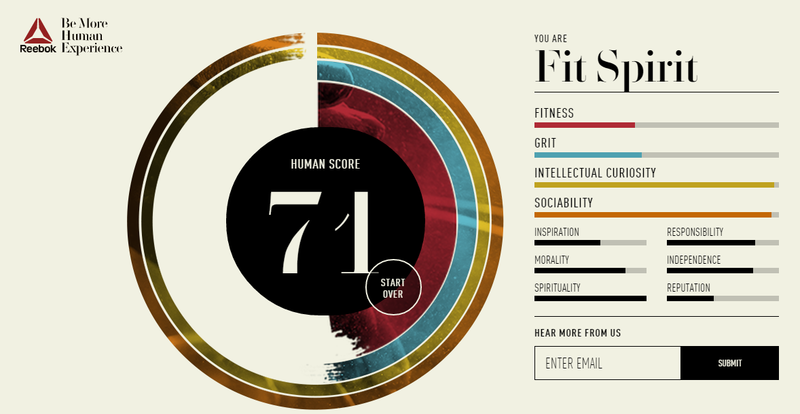 Well, according to Reebok's Human Score Test, I am "Fit Spirit," with high scores in intellectual curiousity, sociability, morality, and spirituality. If you're interested in your Human Score, head on over to Reebok now and take the test. Find out which human aspects you possess the most of, and what you can work on to become as great as the people over at Reebok know you can be.